Fianna Fáil leader Micheál Martin is angry that RTÉ has declined to allow him to participate in a televised debate on the referendum. While Taoiseach Leo Varadkar has ruled out going head-to-head with No campaigners, representatives of Mr Martin told RTÉ executives three weeks ago that he was enthusiastic about the idea. Sources say there was considerable annoyance last Monday when it emerged the national broadcaster invited Sinn Féin leader Mary Lou McDonald to be the political representative for the Yes side on 'Claire Byrne Live'. One senior Fianna Fáil figure suggested to the Irish Independent that RTÉ "had their own political reasons" for choosing Ms McDonald. Waterford Fianna Fáil TD Mary Butler, who is to the forefront of the Love Both campaign, was the political representative for the No side during last Monday's heated programme. RTÉ sources noted that it would be highly unorthodox to have two politicians from the same party on opposite sides of a live debate. Health Minister Simon Harris will represent Fine Gael on next Tuesday's 'Prime Time' debate. Although saying he has been "very involved" in the campaign, the Taoiseach has opted out of debates. He will be interviewed one-to-one by Sean O'Rourke on radio today. 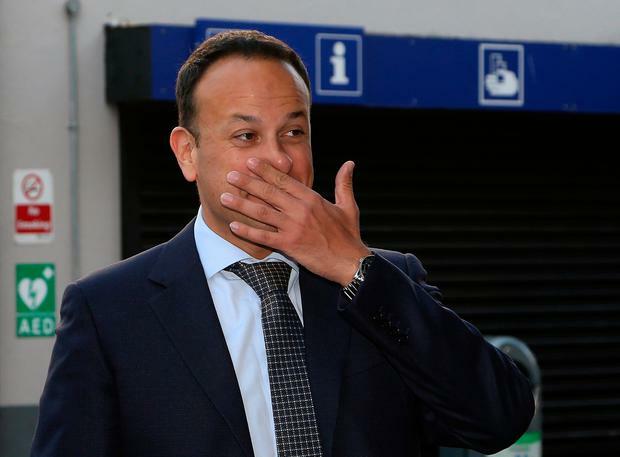 Government sources have questioned who Mr Varadkar's challenger would be, as it would not be normal for a Taoiseach to debate with non-politicians. All the leaders of the main political parties are backing a Yes vote. Mr Martin appeared on last night's 'Six One News' for a standalone interview and is expected to be offered at least one radio slot ahead of next Friday's vote. But a source close to the opposition leader said: "We met with RTÉ and said he was available. Then RTÉ went to Sinn Féin. They seem to want to put us in the No box to suit their own agenda." Fianna Fáil has the largest number of TDs who oppose repealing the Eighth Amendment - but the party hierarchy believes this should not exclude Mr Martin from the debates. A spokesperson for the broadcaster told the Irish Independent: "Micheál Martin has to date featured on various RTÉ programmes regarding the referendum, and will continue to do so, including coming into RTÉ studios for a live interview on the 'Six One News'." Asked why Mr Martin has not been selected for any debate, the spokesperson replied: "RTÉ news and current affairs does not comment on editorial decisions around guests featured on its programmes." The Fianna Fáil leader, who only backed repealing the Eighth for the first time this year, will be a panellist on TV3's 'The Tonight Show' next Wednesday. Meanwhile, in the Dáil yesterday, Tánaiste Simon Coveney urged people to "look at the facts rather than the posters". "We must recognise that in any campaign as emotive and divisive as this campaign, one gets people who are desperate to win an argument and may present the facts in a very emotive manner. I respect both sides in this referendum campaign," he said. Eilish O'Regan The Irish Family Planning Association said it hopes to start providing a medical abortion service from Monday January 7 - but it is still waiting for sign off on vital supports from the HSE. Eilish O'Regan and Cormac McQuinn Women who avail of abortions will not have to pay for the service. Laura Larkin THE Eighth Amendment has been officially repealed today.